I love my new site. It started as a fun way to experiment with design. The idea was to throw all preconceptions out the window and see what I can come up with from scratch. I picked the most simple idea I could and let it roll. This article is going to talk about what makes this site so cool. 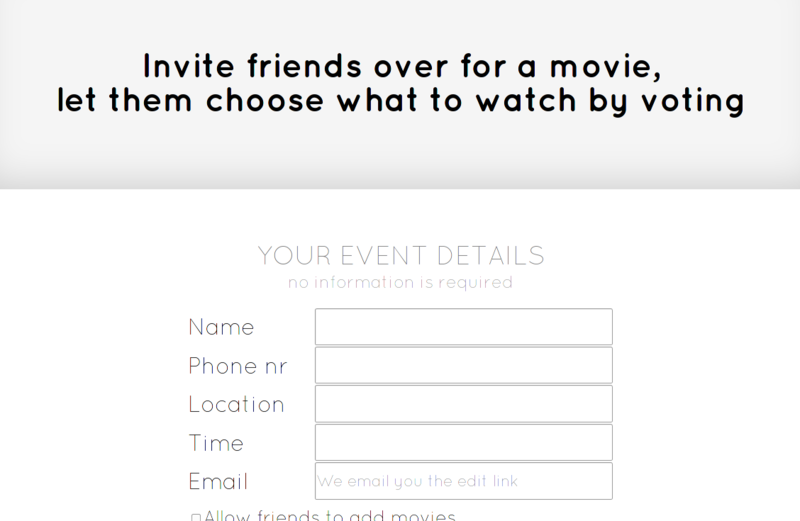 MovieAtMyPlace.com is an "invite your friends over for a movie" event creator with special features. This means if you don't provide any information, the event is still functional. Here is how the invitee sees the event with full details and no details provided. As soon as you enter your email you get the link to this event so you don't lose any work upon accidental tab closure for example. This is where my idea started in the first place. Sometimes there are a few specific movies I want to see, but which movie will attract the most friends to come over? Note: Animations can be improved, a lot. The correct title is fetched from Rotten Tomatoes. At first the site looks bland. It's supposed to. It makes inserting movies even more satisfying. The background changes according to the top voted movie. Obviously trailers should be easy to view. Well, just click on the movies title. Since it searches youtube by title and year, it also finds foreign movie trailers. Any self respecting website today fits in any screen size. Sometimes users are annoyed and want to shout at you, you better be there to hear it! The about page reveals itself nice and smooth (this gif doesn't serve the animation right, you've got to try it yourself). Having worked on this for two months I'm pretty satisfied with the result. Why two months? The design had many rewrites as users gave feedback. There's still stuff to improve, but I've moved on to other projects for now. I'm still curious to hear what you think of it though, so drop me a line down below!